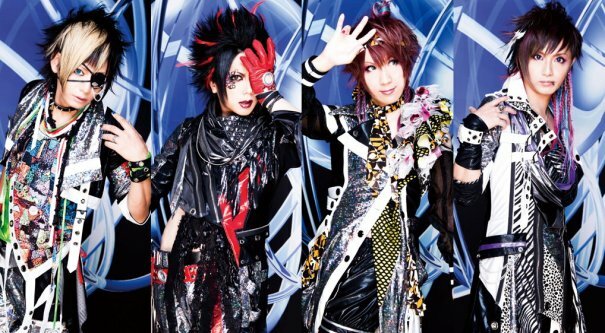 In late 2011, Rame announced that he would be starting a brand new band named Black Gene for the Next Scene. Ever since Rame’s announcement, fans highly anticipated the unveiling of the other members. It wasn’t until their first live at Shibuya Star Lounge on November 1 that the mystery was lifted. The thirst for a taste of their new music was soon quenched when they announced the release of their first single entitled DOOM for January 11 2012. DOOM was released in three types. A hosts a bonus DVD which includes the music video for the main song, “DOOM,” while the single’s B and C types each hold a bonus track. Each member of BFN brings a long resume to the band. Vocalist Ice was formally known as Eros and sang for the galaxy metal band XodiacK. Guitarist Toki has played with such bands as DIXIES, SHAFT, and AniOtaku, but he is mainly known for his reputed work in Babylon. Drummer Sala has been in bands such as L and Lemon Squash, working mainly as a support drummer. Finally, bassist Rame is a former member of the popular and recently disbanded Vidoll. Their music can simply be described as electronic rock, but the rabbit hole goes much deeper. There are nostalgic elements deployed in “DOOM” for starters. The constant heavy drums and vicious rhythmic lyrics could be compared to Kagerou at times. The choreography Ice instructs the crowd in at their shows is a little different from the usual, creative and strange to say the least. As for their start-up visual style, the band keep it pretty flashy, without melding into one another. However, the most shocking transformation is vocalist Ice whose jacket and silvery lips really stand out. Rame maintains his own unique fashion sense by returning to an older style he once favored in Vidoll. Sala has chosen an elegant look and while Toki’s furry outfit seems a little strange at first, when you watch it in action in the music video of “DOOM,” it really makes a statement.